When you become a mom you realize your life is no longer about you, that most night you will not get what you want and that you would do anything when your child has a bad day. As mom’s we do what we can to show them that the day does not have to all be bad, one bad thing doesn’t equal a bad day. When it comes to my kids I cook what they love, a little distraction to get back on track to happier days. 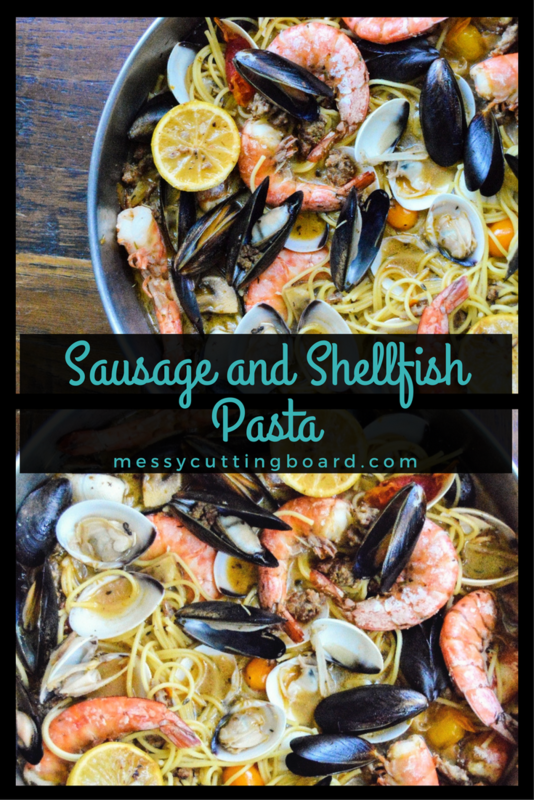 Sausage and Shellfish Pasta is one of those dishes that put a little happy into my little girl’s rough days. Kids! When one bad thing happens it seems like the entire day goes downhill. Don’t get me wrong most thing they bounce back from like nothing ever happened but when your son takes your daughter’s tablet (which we use for therapy and entertainment) and decided it is best to use in the dog’s water dish, yeah there is no turning back from that. Fried, dead, the tablet is a complete goner and mine wasn’t good enough even though they are the same thing. All in all, she handled the situation extremely well, however she was a bit down. So I decided since she was such a big girl and didn’t get upset with her baby brother I had to switch up dinner to her favorite rustic Sausage and Shellfish Pasta. I discovered that grilled lemons are purely amazing, it is lemon flavor with a little smoky huge. So for the lemons in this recipe, I cut them in half and grill at least one hour prior to cooking dinner. You want time for them to cool so they are easier to handle. If you grill and use right away you risk burning yourself, and be careful because the juices will run easily when you remove them from the grill use tongs and place lemons in a heat resistant bowl. Another prep you want to do is make sure your shrimp are cleaned, deveined and the mussels and clams are rinsed well. If you don’t clean the shellfish you will have a grainy gritty dish. I used pre-made spaghetti noodles and cooked those 1 minute shy of package directions because I want the noodles to finish cooking in the sauce. Before straining the pasta I take 1 cup of the pasta water because there are some starches in it and it will be added to the sauce and pasta later. 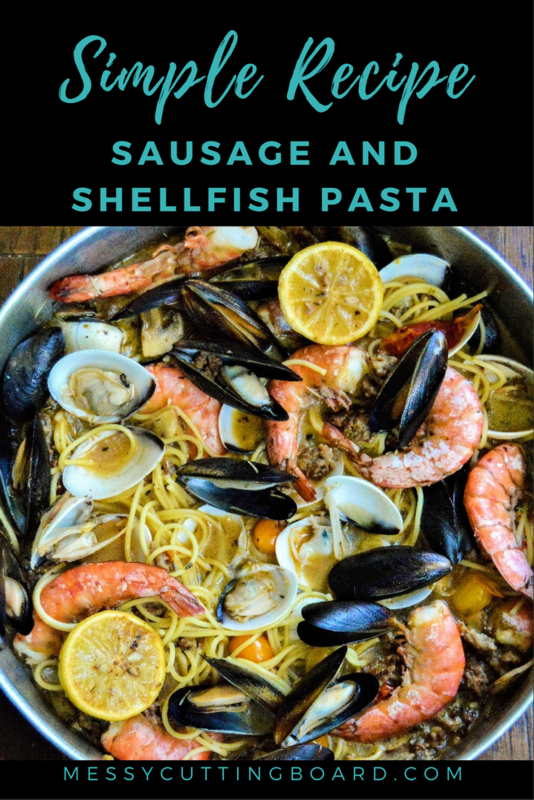 The first step to this one pot Sausage and Shellfish Pasta is to brown the mild Italian sausage then add cherry tomatoes (red and yellow), shallot, mushrooms, thyme, garlic, salt, and pepper allow to cook over medium low heat until tomatoes start to burst. Add white wine and the juice from 1 grilled lemon simmer and allow to reduce to half the amount. For flavor, I add vegetable stock brings to boil. Before adding the shellfish add pasta and pasta water and allow to cook for 2-3 minutes uncovered. Now add your cleaned shellfish cover and let cook until mussels and clams open up and shrimp turn pink. As you can see I left everything in its shells it makes this dish rustic and a little fun. Time to serve up with some warm toasted garlic bread! 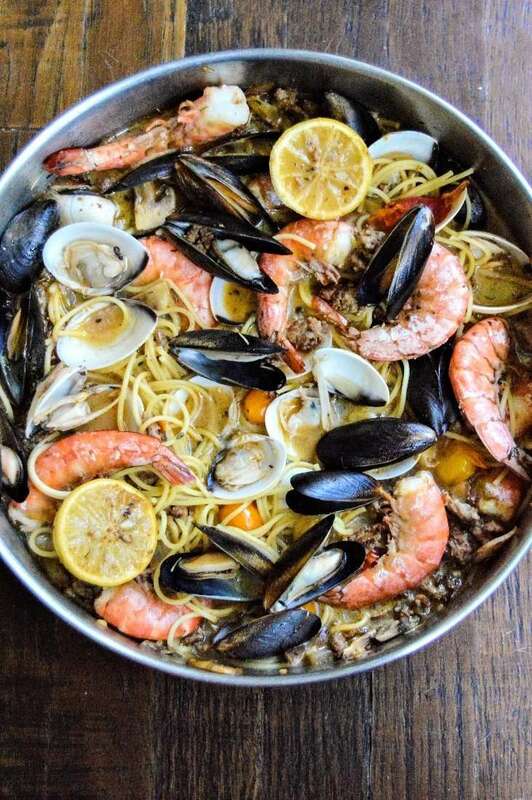 There is nothing better after a long day than a nice big bowl of pasta that is unless you have a nice big bowl of Sausage and Shellfish Pasta. 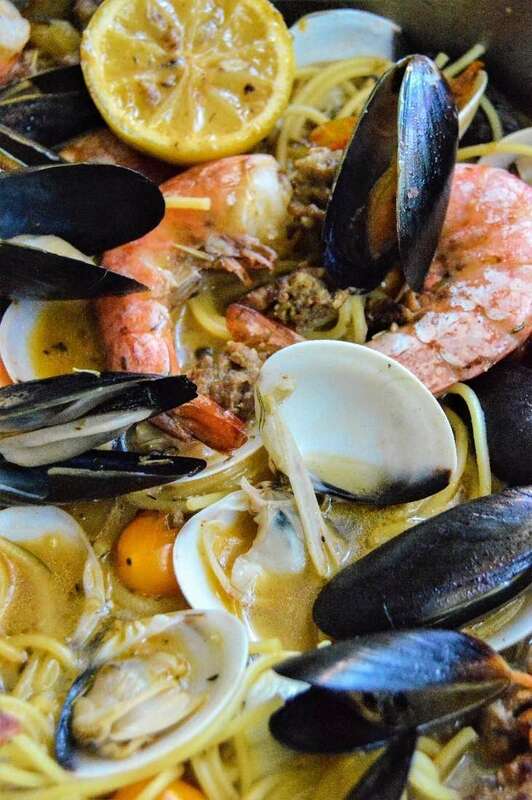 There is nothing better after a long day than a nice big bowl of pasta that is unless you have a nice big bowl of Sausage and Shellfish Pasta. Prep all the ingredients grill lemons at least one hour prior to cooking dinner so they are easy to handle and you avoid getting burned. Be careful the juices will run easily when you remove them from the grill, use tongs and place lemons in a heat resistant bowl. Make sure your Shrimp are cleaned and deveined and the mussels and clams are rinsed well. Cook the pasta shy 1 minute of package directions. You will finish cooking it in the sauce. Before straining reserve 1 cup of pasta water for later. Brown the Italian sausage then add cherry tomatoes, shallot, mushrooms, thyme, garlic, salt, and pepper allow to cook over medium low heat until tomatoes start to burst. Add white wine and juice from 1 grilled lemon bring to a simmer and allow to reduce to half the amount. Stir in vegetable stock brings to boil. Toss in pre-cooked pasta and the reserved pasta water and allow to cook for 2-3 minutes uncovered. 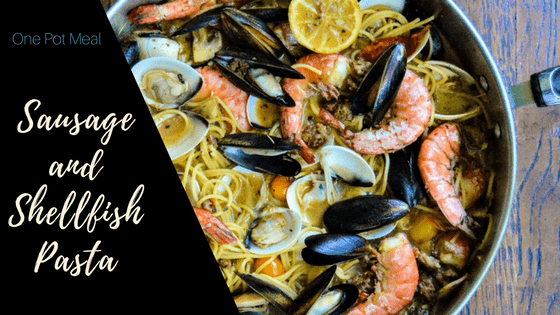 Add the mussels, shrimp, and clams cover and let cook until mussels and clams open up and shrimp turn pink about 5-7 minutes. Serve with the other grilled lemons and some crusty garlic bread! If you don't have time to grill the lemons, a regular lemon juice is also great in this recipe, however, you will loose the smokey flavor.